The Manchester Sheffield & Lincolnshire Railway's (MS&LR, later GCR) Class 9D locomotives were a development of Parker's existing Class 9B (LNER J9) engines. The two classes were identical except for the substitution of Joy valve gear for Stephenson valve gear. The 9D engines were Parker's first goods locomotives to use Stephenson valve gear. A total of eighteen 9D engines were built in 1892-3 in two batches. After a pause when a final batch of J9s were built, Pollitt introduced his similar Class 9H engines. These had Belpaire fireboxes and 18.5in cylinders, as well as detail differences with the journals, crankpins, and springs. Pollitt built one batch of sixty six 9H engines in 1896-7. In 1901-2 Robinson built a final batch of forty 9H engines with smaller tenders and 18in cylinders. The LNER classed both the 9D and 9H engines as Class J10. Between 1910 and 1923, the earlier 9D engines were rebuilt with Belpaire fireboxes. By Grouping (1923), the design had standardised on 20in cylinders and "GC Standard No. 1 Belpaire" boilers. In 1908, No. 134 was rebuilt with a larger Belpaire firebox. Although it was a non-standard boiler, it was similar to that used on the GCR Class 9J (LNER J11). The boiler had a 5ft diameter and longer firebox, but slightly shorter barrel. The boiler was pitched slightly higher, resulting in cab alterations and a higher cab roof. This engine became GCR Class 9M, and the LNER initially included it with class J11. A standard J10 boiler was fitted in December 1924, and No. 134 (now No. 5134) was re-classified as J10. It retained the high cab after the new boiler was fitted. No. 810 was superheated in 1915. A longer smokebox was fitted to accommodate the superheater, and a mechanical lubricator was fitted at the same time. No. 5810 was re-fitted with a saturated boiler in January 1925, although it retained its extended smokebox and mechanical lubricator. The J10s were built for goods work, and they were usually used for this duty. Later in their life, they were also used for some passenger excursion traffic. The first batches were usually allocated to the Sheffield area. The large batch in 1896 was intended for work on the London Extension. They were initially allocated to Gorton, but were moved to sheds south of Sheffield by about 1900. Annesley is particularly noted for having a large number of engines from this batch. The final Robinson batch was initially allocated to the Lancashire and Cheshire areas, although nineteen had short allocations to Mexborough and Nottingham. During World War One shortages, seven J10s were loaned to the Caledonian Railway (CR) from 1915-7. These J10s carried shortened GCR chimneys so that they fitted within the lower CR loading gauge. Ten J10s were sent to Barrow-in-Furness to undergo general repairs at Vickers works in 1921. By Grouping (1923), the J10s were mainly allocated to Retford (22), Sheffield (18), Trafford Park (16), and Walton (13); with lesser allocations to Annesley, Immingham, Liverpool, New Holland, Stockport, Gorton, and Woodhead. Shortly after Grouping, many of the Retford allocation were moved to Northwich. The last two London Extension engines were moved from Annesley in 1927. Thirteen J10s were allocated to the GE area between 1925 and 1933. These were regularly seen at Cambridge, Lowestoft, March, Norwich, and Peterborough sheds. Other than these exceptions, the J10s usually remained in the northern area of the former GCR lines. By 1940, all were in Lancashire and Cheshire, with most operating in North Wales, the Wigan area, and on the Cheshire Lines. Withdrawals started in 1933 but were initially slow, and seventy eight J10s survived into British Railways ownership (1948). During the 1950s, they were noted for short-lived allocations to 'foreign' sheds. In 1954-5, five were moved to the former London North Western Railway (LNWR) shed at Widnes. Darlington also received eight J10s in 1956, and four were transferred to the former Lancashire & Yorkshire Railway shed at Goole. The former LNWR shed at Springs Branch near Wigan, received fourteen J10s in 1952. These engines were popular with the ex-LMS enginemen, and were used on the former LNWR and GCR lines in the Wigan area. Springs Branch was the last shed to operate J10s, and the last two were withdrawn in August 1961. One of these, No. 65157, was also the last MS&LR locomotive in service. The following details are for the saturated J10s. No. 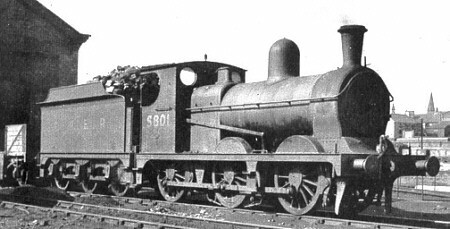 810 carried a superheater between 1915 and 1925. None of the J10s survived into preservation. DJH produce a whitemetal OO gauge (4mm scale) kit of the J10 locomotives. Thank you to Malcolm Peirson for the photograph of LNER No. 5801.